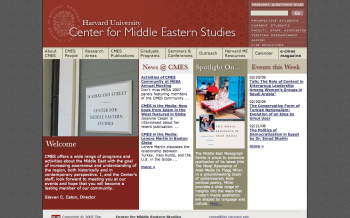 Redfin built a completely new site for Harvard’s Center for Middle Eastern Studies program (CMES). It has a resource scheduler, calendar of events, extensively utilizes views, and we are currently working on a member profile/search for members of the community. It has some slightly different themes based on which section of the CMES you are concerned with (their academic programs, their newsletter, or their community outreach center).